I washed and folded her new footie pjs, placing them in her Matilda bag, along with her favorite board book, a lovey and a new toy. There is a water bottle in there and formula and some almond milk. And now there are some tears as well. Because I’ve been so blessed through twelve years of parenting to never have to hand a baby over to a surgeon, but tomorrow I will. Will place her in capable hands, even if they aren’t mine. Will whisper a prayer over her sweet forehead as my lips brush her brow. Will do what millions of much braver parents have done so often, and for much trickier reasons. This baby, she has consumed my time these past four and a half months with feeding and holding and bonding. She has exhausted me, blessed me, thrilled me, humbled me. I have worked so hard. We all have. Hours of feeding a day, each meal lasting so long it melts into the next, dishwasher filled with baby spoons and formula stained water bottles. Her little tongue works so hard with every bite, every swallow, to push the food and drink past her cleft and down her throat. It’s all so effort-full. And nursing her through a cold brought a new reality: food is only one facet of her difficulties. Poor baby had snot running out her mouth. And she sneezed in her nose, mouth locked tightly shut as it always is. We thought about this beforehand. Wondered if we wanted to put a pic up this way, but until you see it, you can’t know. This is what it looks like y’all. It looks like we’re forcing her mouth open, but that’s Tessie’s hand on her forehead, patting it, not holding her down. She’s happy to show it off. 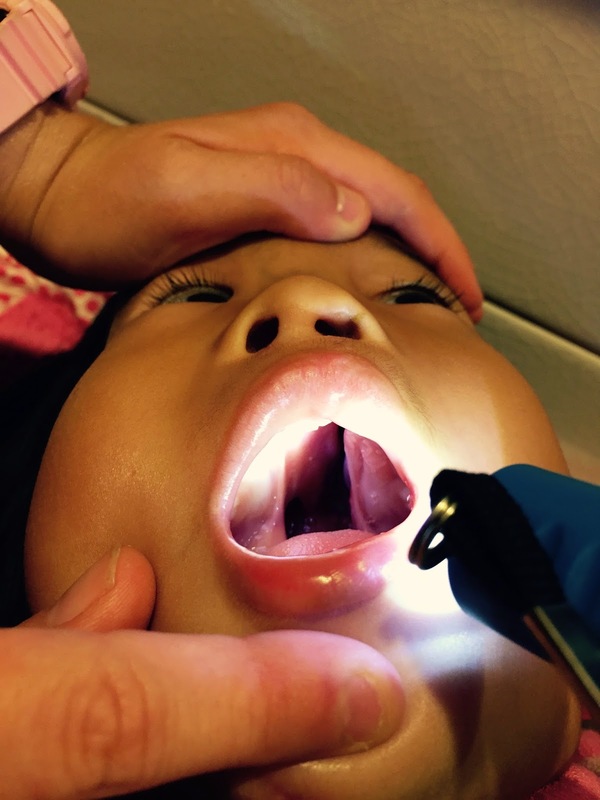 That cleft is the width of my finger at least and goes from her gum all the way to the back of her throat, splitting her uvula in half. When you look in her mouth, you are actually looking at the inside of her nose. This is why food ends up coming out her nose like some horrible play-doh toy. This is why she has had such struggles gaining weight, why it takes hours to feed her. This baby, she is the bravest person I know. She has survived two mothers leaving her, survived nearly starving to death, an abrupt culture/language/family/home/food change. She is a warrior. Which is why, even though my stomach clenches at the thought of the pain she is going to endure, I am so happy that this part of her struggle will soon be over. Tomorrow her surgeon, who in God’s providence is renown in his field, will use the muscles and tissues already there to create a palate for her. He will cover it all with skin he’ll graft from the insides of her cheeks. He will ensure that she has the structure she needs to begin speaking and eating. We. Cannot. Wait. Her cleft, which surely caused her birth mama to have to leave her outside a furniture store on a February day a couple years ago, I’m sort of in love with it. I fell in love with her cleft lip, wonky teef peeking through, mourning when they fixed it in China, even while knowing it needed to be so. She is fearfully and wonderfully made. We know that full well. And we are so thankful: that she is here, that she is well, that she is His. This is me being real. Wondering if I can get a shot of Versed tomorrow morning to. Wake me up when it’s over.